An exciting blend of straight-ahead jazz, standards, originals and Latin Jazz – all with Grace Testani’s unique rhythmic arrangements - featuring songs co-written by Chick Corea, Kenny Barron and Grace Testani. 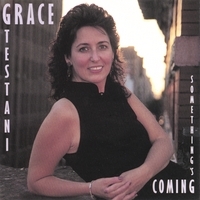 Something’s Coming, released on the Grace Notes label, is an exciting blend of straight-ahead jazz, standards, contemporary songs, and Latin Jazz – all with Grace Testani’s unique rhythmic arrangements. In addition to writing all the arrangements, Grace also shares co-writer rights with Chick Corea (MCA) for the lyrics to his song Windows (vocal version: "Watching the Wind") and with Kenny Barron on his song Sunshower (vocal version: "Morning Sunshower"). Grammy award winner producer, Michael Abene and Grace were fortunate that the musicians she usually works with were all in town at the same time to do this recording with her. You will undoubtedly recognize many of the musicians on the date.